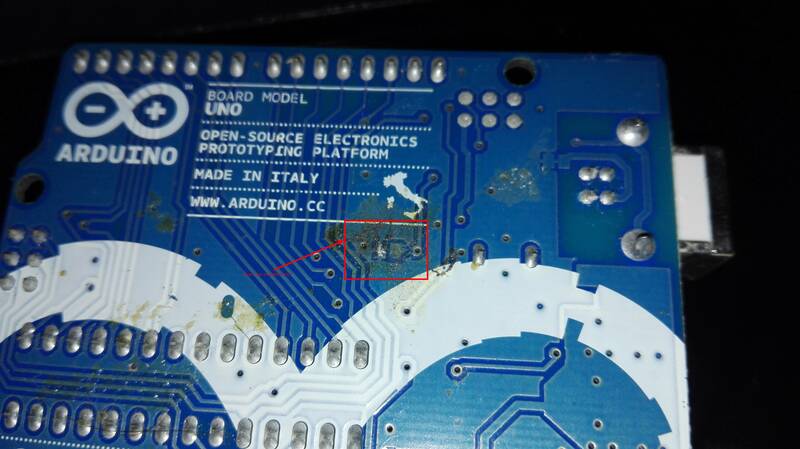 As I see here I need to reprogram the ATMEGA8u2: https://www.arduino.cc/en/Hacking/DFUProgramming8U2 I need to solder a 10k resistor into a specific place. So How I can resolder the resistor in order to reprogram the atmega8u2? Looks like you ripped a pad off. To prevent that in the future, try using more flux and dropping the temp (Max around 320*C/610*F). The iron shouldn't be in contact with the board for more than about 3 seconds. No force should be necessary to remove components. Not to worry though. Common beginner's mistake and not too hard to fix. Gently clean the area up with 91% isopropyl alcohol and cotton swabs. Carefully scrape away the solder mask (blue paint) on what's left of the copper trace all the way back to the via (little hole). Try to remove all the solder mask from the via. Straighten and flatten the pulled up trace. Clean, flux, and tin (apply as thin layer of solder) to the trace and remaining pad. Filling in the via is OK as it will give better surface area to attach the repair. Flux and solder the resistor to the remaining pad to keep it in place and properly aligned for the repair. We need to bridge the gap created by the damaged pad. A globby solder bridge may work, but wire is much better. Find a piece of thin gauge solid core wire (30-22AWG. Some 24AWG from an ethernet cable would do fine). Orient the wire so that it's directly over the remaining trace and also making contact with that end of the resistor. You can trim it to size now or after soldering. It may be easier to keep in place if you trim it after soldering as long as you have some fine flush cut pliers. Either way, leave enough that it covers the entire cleaned and tinned portion of the trace. Flux and solder the wire to both the resistor and trace. This will complete the circuit. Clean again with alcohol. Let dry. Test the board. Give this Adafruit article a read. I've got extensive professional soldering training and endorse it fully as the best beginners soldering guide I've found. That pad connects to the same place as the circuit used for resetting the ATMega328P chip - that is, pin D7 on the ATMega8U2. It just pulls the pin PD7 down to ground with more "force" than the internal pullup of the pin itself. You can attach that resistor to anywhere along that line, and probably the most convenient place would be to the ATMega16U2 side of capacitor C5. That capacitor has one end linked to the RESET pin on the main Arduino header, so you can connect a DMM in continuity test to that pin and "buzz out" each capacitor until you find the one point where it beeps (I think it's one that's right next to "Reset EN"). Carefully solder your resistor to the opposite side of the capacitor to the side that beeps (the side nearest the ATMega8U2 chip, probably), and connect the other end of the resistor to GND on one of the main headers. By the way - get yourself a flux pen and apply flux to where you are soldering before you start soldering. It should help you avoid these kind of problems in the future. Also get a proper temperature controlled soldering iron (I use 350C for mine most of the time) and some solder wick to help recover from solder messes. All part of the standard EE's toolkit.